It was my birthday weekend and decided to take our RV up to Jackson to have dinner at the buffet with 2 other family members who had birthdays as well. We had no reservations and when we arrived the park was quite full. Thornton greeted us at the check-in desk and what fantastic customer service. While the park was booked, he was able to talk to the manager and get us a space for both Friday and Saturday night. He was very informative and what a great demeanor. The park is very nice and they have a shuttle that will pick you up at your space and then drop you back off again at your space between 8 am and 11 pm. This runs about every 20 minutes or so. The park itself is lovely and we were told that they will be expanding the park over the next year to include another 150 or so rv spaces. They pool is lovely though only 4 feet deep. They have 2 jetted spas and bathroom showers for those who don't want to use their own. They provide free cable and internet during your stay. The prices are awesome and I cannot say again how lovely it was with grass and a nice level area for the motorcoach. Very peaceful and quiet even for a weekend. WE will definitely be coming back here and enjoying the amenities. I would highly recommend you try it out. Again, my special thanks goes out to the A-One customer service person. You made our day and my birthday awesome. Also, the shuttle bus drivers who are friendly and very informative as well. Enjoy your time here. Outstanding park. I highly recommend it! This is one of the best parks in California. It is hidden away from the main travel roads, but well worth the detour. All of the spaces are very well maintained. The staff was always very friendly. The RV spaces are spacious and well designed. Each space is slightly offset so you have a view of the countryside. There is a frequent shuttle bus to the casino. There also is a nice paved walking trail around the park for your canine companion. This park has 10, 10, 10 rating on Good Sam for good reason. We have stayed many times and I realized I never gave a rating. We so enjoy the park. Everything has always been perfect. So friendly, so clean and the beautiful heated pool and 2 spas. We love the 1 mile walk around the park. There has never been anything that we have not been 100% completely satisfied with. So looking forward to our next stay. I've stayed at Jackson RRV on a number of occasions and have always enjoyed the stay. Staff has always been very friendly, helpful and courteous. All of the facilities truly are deserved of 10s. I've never had a problem with noise due to shuttles, neighbors or wild crickets. I have a 40' Allegro Bus and navigating the park is easy and the pull-thru is more than adequate. The site itself has a concrete pad and all the necessary hook-ups which are always in working order. I really enjoy the walking trail that surrounds the perimeter of the RV park and the casino is just a (frequent) shuttle ride away. If you intend to watch a show at the casino, book early. 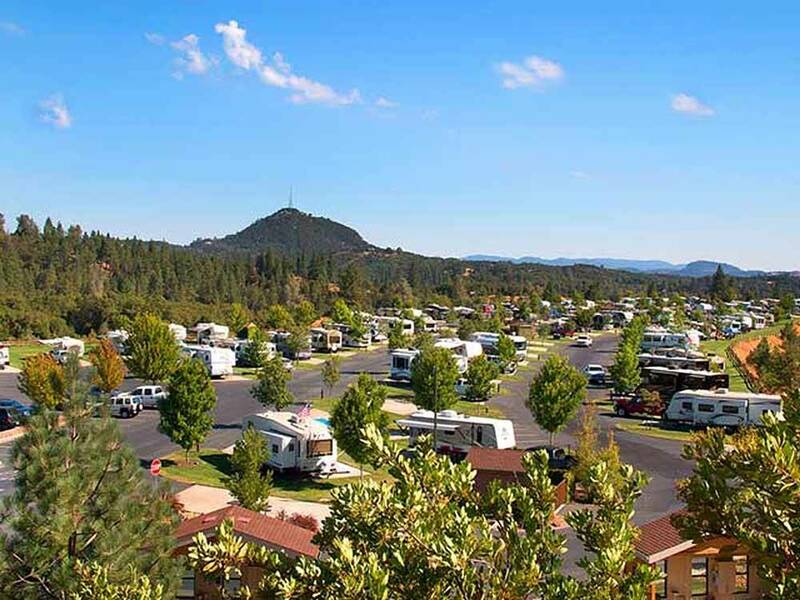 My only advice is to give yourself plenty of lead time for reservations 'cause Jackson is a very popular RV park and therefore trying to go the short lead time reservation route normally does not work. That is not to say the staff would not try to get you in due to cancellations, but planning is the prudent thing to do. For us, it is always a restful and enjoyable stay. Enjoy! This was our first visit to this park. We would highly, highly recommend it to anyone. The park is beautifully maintained. The inside roads are wide, the RV spots are large concrete pads with beautiful grass alongside. The staff was super friendly and helpful. There is so much to see and do in the area. We loved the fact that a bus picked us up and took us to and from the casino. It ran every 30 minutes. Another perfect trip to this well maintained park. The trees were in their fall glory and the park was nice and quiet. My dog met some new friends and enjoyed her numerous walks about the park. One other camper complained to me about problems with his cable but I had no such problems. I used the rv wash down the road at the gas station and was impressed at how it cleaned my rig. Love this park. Beautiful setting, spacious sites with large paved pad, lawn and picnic table. What more could you want. We were here for just 1 night as they were sold out for the next night. There were some paved paths which were great for walking our dog. We took the shuttle to the casino and it ran every 15-20 minutes and they drive through the park so we just flagged them down when we were ready to go. On the return we waited less than 5 minutes. This would be a great base from which to explore the California Gold Country. We have stayed many times and will continue to return. Great staff and beautiful park. Spaces are wide with green grass and a little shade. There is a fenced dog park, bocce ball court, pool and spa, and walking trail. Only downside is shuttle bus to the casino runs every 30 minutes from 8am to 11pm which can be annoying on occasion. We come at least a couple times a year to just rest and relax with people that appreciate their customers.